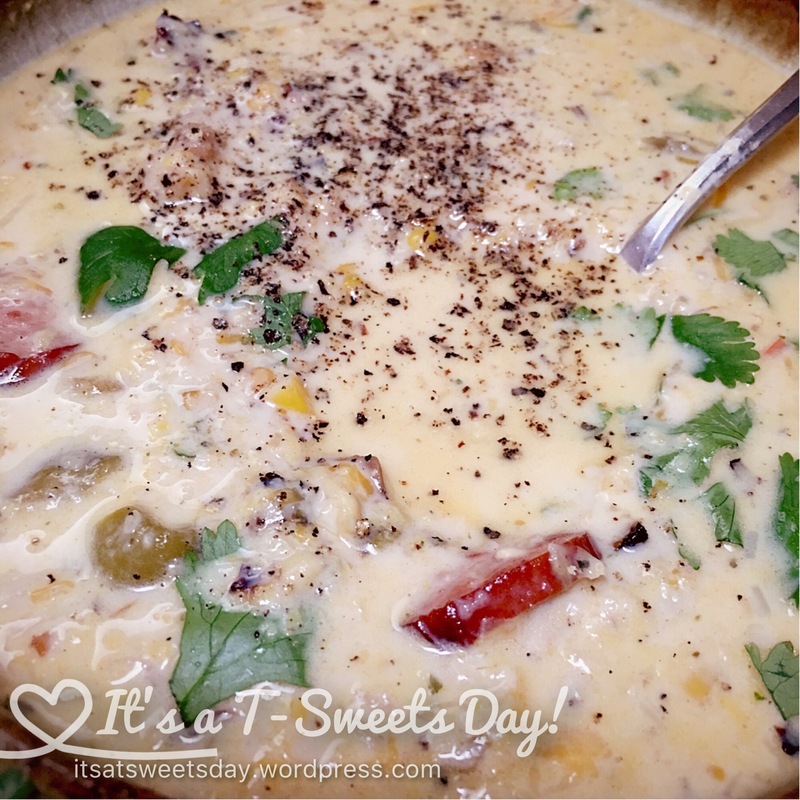 Rainy Day Corn Chowder – It's a T-Sweets day! Published on September 8, 2016 September 7, 2016 by Tracy @ It's a T-Sweets Day! It has been raining all day:). It is BEAUTIFUL here in our little Arizona valley. We rarely, if ever, get rain like this. It was raining when I woke up and has continued to rain all day. Yea!!! We need this moisture so badly. I don’t know about you, but rainy days make me want a pot of soup on the stove so the aroma can compliment the smell of rain outside. I had some corn and sausage in the fridge that were just calling to me. So, I combined them into this delicious chowder filled with hearty meat. Yum! 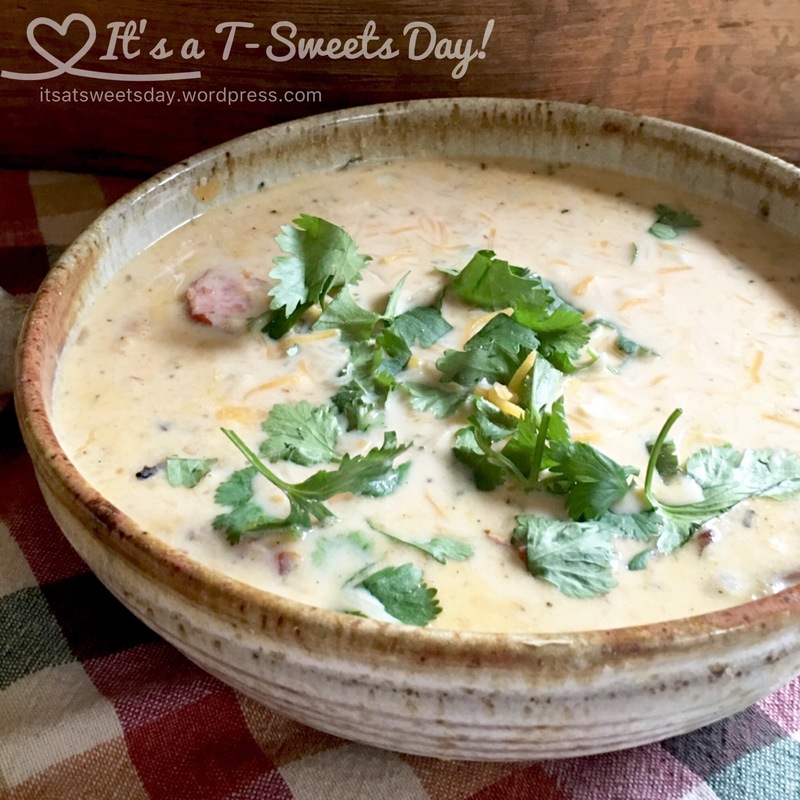 Recipe by Tracy@It’s a T-Sweets Day! In a large stew pot, cook bacon and sausage until brown and somewhat crisp. While the meat is cooking, heat the oil in a large skillet over med/high heat. Add the onion and cook until clear and soft. Add garlic and cook for another minute. Add the corn and cook for 5 min stirring occasionally. Add the chicken broth and cook for 15min. Add 1c of corn mixture in with the meat and stir. Place the remaining corn mixture in a blender and process until smooth. Return the blended corn to the meat mixture and stir to combine. Add the green chili. Add the milk and seasonings. Cook for another 5-10min. Add the cilantro and cheese. Reserve a little to garnish the soup in the bowl. There you have it — Rainy day goodness in a bowl:). Enjoy! It is definitely a T-SWEETS day!! Previous No More Ugly Wipes! We had a nice breeze today. Jealous of your rain. Thank you for the recipe I will give it a try. Oh yes, the rain is such an answer to prayer around here:). This chowder is so yummy. 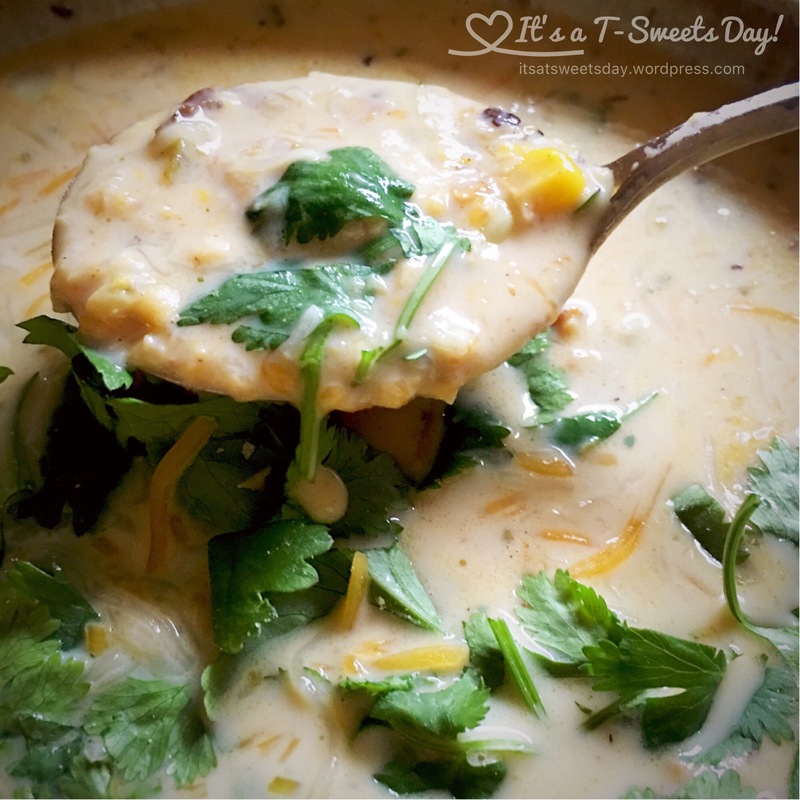 If your family likes corn, you will love it!